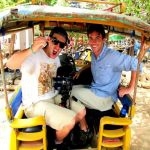 The Vagabrothers Alex and Marko Ayling, who won My Guide's Biggest Baddest Bucket List(BBB), a six month trip around the world, got to tick Gili Trawangan, the paradise island, off their List. 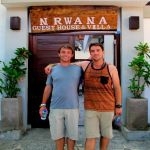 Their visit was short but they still managed to party the night away after an afternoon cruise around the 3 Gili islands on the Drunken Monkeyz Party Boat. The booze cruise must have made them hungry, which inspired them to eat at the Pasar Seni (Art Market) trying the local Indonesian cuisine, much to their satisfaction. However, after the delicious local meal, the night wasn't over yet; they ventured on to Sama-Sama Regae Bar, to try out the island night life. 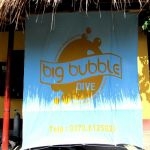 The following morning, Marko and Alex headed to Big Bubble Dive, where they had a go at scuba diving to see what the underwater world around the Gilis had to offer. They had a great experience, marvelled at the variety of underwater life and even saw turtles. The last few hours were spent cycling around the island getting a glimpse of what local life is all about, rich and poor, privileged and still-to-be-uplifted local people. This last bicycle ride caused Marko to make some quite controversial remarks, but maybe he has a point. Something needs to be done to allow local people to share in the income brought in by the boatloads of tourists.